As my plane turned towards Istanbul I saw the dry landscape below. It was ploughed into fields but there seemed to be no dividing hedges. The only visible green was trees edging the numerous creeks. Apart from that, every inch seemed to have been tilled by man. I don’t know what they were growing, but it seemed pretty arid. The other striking view as we flew closer to the city was the cloud hanging above the towering minarets of the mosques. It was brown. Then we landed. I queued twice to have my passport stamped. The first time I was sent back because I hadn’t got my visa. In fact my whole trip to Turkey was a bit like a game of snakes and ladders – there seemed to be quite a lot of snakes. Worse than the administrative hassle of getting to Heathrow was arriving in time for an 11.30am flight and being told it was delayed until 5pm. Someone had died on the incoming flight so it had to turn back. Then a ladder. I managed to get an earlier plane by buying a ticket at the last minute – albeit an expensive one. 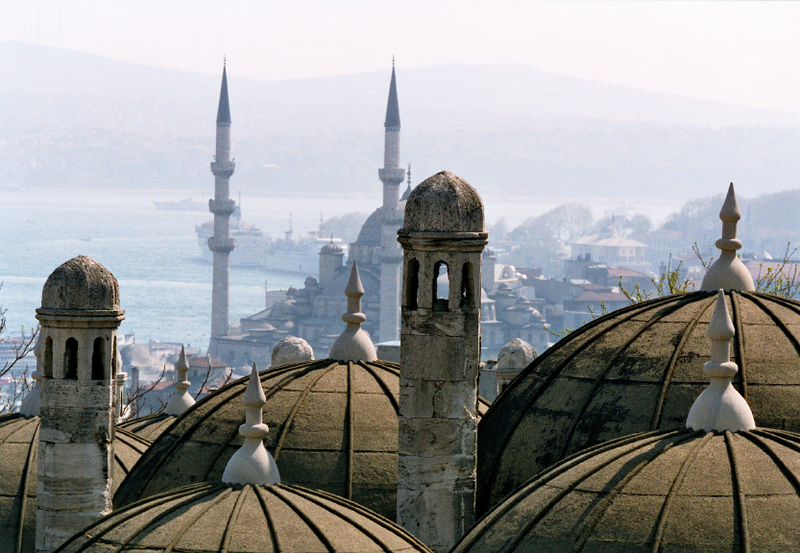 Straddling Europe and Asia, Istanbul is an exciting city. On one side of my small and quirky hotel was the Marmara Sea and on the other taking up the whole of the window from my tiny room was the Blue Mosque. Later in the trip I took a boat up the Bosphorous towards the Black Sea. The purpose of my trip was to make a speech for a fabric conditioner business. An interesting brief given that I don’t actually use fabric conditioners myself. But I discovered that there are some environmental advantages to the product – most significantly for hand washing. The company demonstrated how their conditioner helped people save water by reducing the need for rinsing clothes from three times to only one. This product is only available in the Far East and Latin America – in countries where hand washing is predominant. To get water-saving benefits in washing machines was more difficult because it requires changing the machine itself. However, fabric conditioners do apparently help keep clothes in good condition and maintain their colour. If this meant people bought less clothes there would be a real benefit but I fear that very few of us buy more clothes simply because our old ones have worn out. I’m afraid that I’m culpable in this respect. I bought a couple of rugs and even an old velvet coat from The Grand Bazaar – and I can’t say that the purchases were made simply on the basis of replacing old stuff. This entry was posted in BLOG, Business, Cities & Towns, Detergents & Cleaning, News 2007, Speeches & Events. Bookmark the permalink.